If you have a family or do a lot of entertaining and you’ve been wondering about the best way to get your cooking done, then perhaps an extra large electric griddle would be right for you and your home. There is a wide variety of different models to choose from, as well as many manufacturers. They are not all created equal; some perform better than others and all of them come with different features that you need to consider carefully. Amazon is where you’ll find a good range of these types of griddles. The nonstick surface is pretty universal with these appliances and you will find this feature on most models. Some of them come with drip trays to drain off grease. These griddles come in different sizes, so if storage space is a concern, you should find out about the dimensions of the particular unit you’re interested in. Temperature controls are different for each model and some work better than others. Because we’re talking about a large surface area, you have to pick a model that will heat pretty evenly across the surface with no hotspots anywhere. Many units are dishwasher-safe, and can be cleaned easily. While you can grill meats using these griddles, they are not great for steaks, as they don’t go to high enough temperatures for a nice sear. For that you’ll need an electric grill that comes with a function for searing. If you mainly make these items for just your small family, you may want to consider a smaller griddle or electric crepe maker for crepes, pancakes, eggs and bacon, or even a waffle maker that comes with griddle or grill plates. If you want to keep food warm while you finish cooking multiple batches of pancakes so that everyone can eat at the same time, you can get an electric griddle that comes with a warming drawer. An electric skillet is also good for steaks, stews and stir fries. There are two similar Presto electric griddles that score well with customers. The Presto 07061 22-inch Electric Griddlecomes with removable handles so that when not in use, the griddle part is detached via simple latch clips and can fit into standard 18” kitchen cabinets. The cooking surface measures 22” by 11.5” and can fit up to eight 4” inch pancakes at a time. The large cooking area of the Presto Tilt ‘n Drain Big Griddle Cool-Touch gives you 285 square inches of space, so you can cook really big meals with it. The entire exterior surface of this model is cool to the touch, providing safety in homes with pets and children. The design allows you to tilt the unit to provide drainage when cooking meat but you can pull it back to a level surface for eggs or pancakes. A built-in backstop ledge makes sure your food stays in place. Both models from Presto come with a wattage rating of 1500 and feature Control Master heat controls to keep the temperature of the cooking surface maintained at the proper level. You can go from 200F to 400F. There’s a slide out drip tray as well to catch draining liquids and fats, making for easy cleanup and disposal. When you remove the heat control, the griddle unit can be fully immersed in water. With the Presto 07061, there have been some reports of uneven surface cooking temperatures, but most people reported general satisfaction and were pleased with its performance. Its nonstick surface works very well, and there are reports that no butter or oil is needed when cooking. With the Tilt ‘n Drain, customers say that the cooktop reaches its temperature very quickly and maintains it evenly even when used outside. They also love that it can be used for making large batches of food and that it’s easy to clean. One review mentions that if you cook a large batch of bacon in one go, the drip tray will overflow. Regular Teflon non-stick surfaces have to be treated carefully – no metal spatulas or harsh scrubbing pads, or the non-stick treatment will deteriorate rapidly and be unsafe to use. For a safer and more durable surface that is also non-stick, the All-Clad 99014 GT Electric Griddle is treated with a hard anodized cooking surface and will be like brand new for years. The 20-Inch by 13-Inch has two independent heated zones side by side with the temperature ranging from warm (180F) to sear(480F) and each zone has its own dial control with indicator lights. So you can use one side for eggs and one side for bacon at the same time. This is one of the most powerful griddle of the bunch, coming in at 1800W. A large drip tray easily slides out holding the excess fat that drains from the slot above. The exterior with handles are in polished stainless steel and so is the removable splash guard. Both the tray and guard are dishwasher safe. While hard anodized is much more durable than Teflon, customers say you still shouldn’t use metal scrapers and spatulas on it. They also advise not to use the included scraper as it leaves marks on the surface. However, they say that there is no peeling and it lasts a lot longer than most non-stick griddles and food does not stick. Designed and manufactured in America, the Broil King PCG-10 is one of the best of the griddles. It has a ceramic surface, completely chemical free; nothing will stick to it while cooking. It is quite large at 21-by-12 inches. Its rating is 1500 watts and you can cook a dozen eggs or 2 pounds of bacon at any given point in time. It comes with a removable temperature probe. It is ideal for large families or for parties and the maximum temperature you can cook at is 425F. It has a rear leg-tilt option that will allows you to drain off the grease while cooking and has a removable stainless-steel backsplash and cool touch stainless steel handles. A removable drip tray is completely immersible but make sure to remove the probe first. Designed for home use, it mirrors industrial cooking equipment and is of a professional quality. It is sturdy, well-made and long-lasting, yet is extremely lightweight and sure to provide years of use. Reviewers say that it heats evenly across the surface. While one user says that there is a light residue build up over time, there is an easy way to prevent it. Use hot water to clean up the surface as soon as you’re done using it. 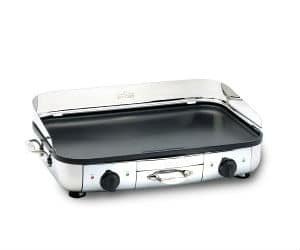 The Wolfgang Puck Reversible Grill and Griddle is a unique appliance that combines both the grill and the griddle, so it has a variety of different uses. Because it is a grill on one side and has raised ridges in it, you can get the grill markings on your meats that an ordinary griddle wouldn’t create. That also means that your meat sits just a touch off the surface to allow extra fat to drain off, leaving a juicy, well cooked and healthy piece of meat or patty. You can use the grill’s side for meat, and then turn it over to the griddle side to cook your pancakes and eggs. With a large cooking surface at 205-square-inches, you can cook large quantities of food at the same time. It has an adjustable temperature probe, so you can be sure everything is cooked at just the right temperature. A dual-sided scraper is included, and cleanup is easy. This model is slightly bulky, so you may want to find a special place to store it. It has a safety interlock that will not allow its use without the drip tray being in place. The drip pan channels will drain away grease. It is a powerful model, boasting 1800 watts. Users say that this is the grill that most closely replicates the results of an outdoor grill, that the surface heats very evenly, grease drains away properly and is easy to clean. The Black and Decker GD2011B Family Size Griddle is a relatively simple and inexpensive model that is especially useful to the average family. It heats up to 400° and contains a removable dishwasher-safe grease cup. It has a nonstick cooking surface and also features a drip tray for easy cleanup. It will make up to eight servings of food at once and is dishwasher safe. There have been reports of uneven surface temperature, yet performs well overall for the price. ← What is the Best Food Processor with Dough Blade?